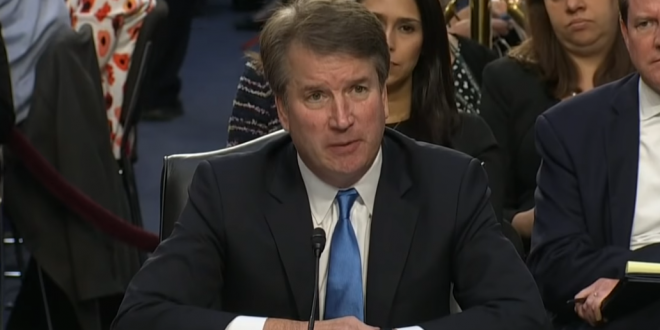 LIVE VIDEO: Brett Kavanaugh Testifies On Allegations - Joe.My.God. A new thread for the second half of this exhausting day. Christine Blasey Ford didn’t try to play it cool. She didn’t worry about being perfectly composed. When she needed caffeine, she asked for caffeine. When nerves got the better of her, she giggled nervously. She smiled at odd times, the way all of us smile at odd times. And when Republicans and Democrats on the Senate Judiciary Committee preened and sniped and made vaguely self-important fools of themselves, she showed her confusion, her amusement, her surprise. She wasn’t some partisan warrior. She was America. I’m writing about her testimony alone, and I’m writing before Brett Kavanaugh’s turn. It’s important that he get one and be treated with respect and an open mind. But she was impressive. She was persuasive. I sensed no outsize anger. I detected no guile. If she was pushing an agenda, I didn’t catch a whiff of it. If she was relishing the spotlight, I didn’t spot a sign of it.